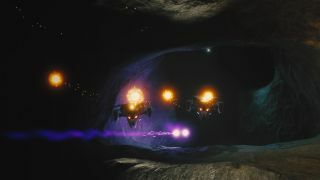 Descent-style 6DOF hits early access on March 13. At around this time last year, Revival Productions was running a Kickstarter for its spiritual Descent sequel, which is more interesting than the actual recent Descent sequel, as this one's being made by many of the people behind the original games. They released an early demo so we could see what they were aiming for, and now, one year later, Revival has released an updated demo version, so we can see how Overload has progressed over the last 12 months. You can find Overload Playable Teaser 2.0 on Steam here. It's a "complete refresh, with updated graphics, sound, and gameplay", just so you know. The demo comprises a "training level, a sample single-player 'destroy the reactor' level, and two Challenge Mode levels that let you test your skills against a horde of enemies".